In a large stainless-steel frying pan, heat the oil over moderate heat. Add the onion and cook until starting to soften, about 3 minutes. Add the ground beef and cook until the meat is no longer pink, about 2 minutes. Stir in the wine and simmer until reduced to 1/4 cup, about 2 minutes. Add the tomatoes, oregano, and the salt and pepper. Reduce the heat, cover, and simmer for 15 minutes. In a large pot of boiling, salted water, cook the perciatelli until just done, about 15 minutes. Drain and toss with the meat sauce, vinegar, Fontina, Parmesan, and parsley. Serve with additional Parmesan. 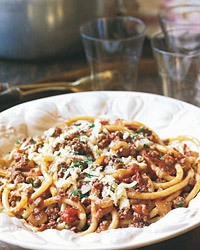 The meatiness of this dish and the acidity of the tomatoes make a Sangiovese-grape-based wine ideal. Look for a Chianti Classico or a Rosso de Montalcino from the Tuscan region of Italy.